The dark arts and sciences of restoration are midwives nowadays always present during the preservation of paintings in personal private and public collections. Restoring paintings to preserve them for the education and enjoyment of generations yet unborn is a quite modern concept. In earlier times it would have seemed quite strange that anyone should want to preserve old paintings in poor condition; the practice back then was rather, to repaint the damaged parts of the painting or, where the style had become old fashioned, in the case of portrait paintings to change the dress or the style of the wearer’s clothes to bring them up to date. There are plenty of examples from the past where works of art, recognised as great even in their own times, were unceremoniously modified, damaged or destroyed to meet the exigencies of the moment. Leonardo da Vinci’s Last Supper, (Il Cenacolo) in the refectory of the church of Santa Maria delle Grazie, Milan was completed in 1498. In 1652 the Dominican prior of the day knocked a door through the wall in the refectory on which it was painted taking with it parts of Leonardo’s masterpiece. A century later Rembrandt van Rijn’s Night Watch or, 'The Company of Captain Frans Banning Cocq painted in 1642 for the Great hall of the Amsterdam Arquebusiers called the Kloveniersdoelen was the subject of similar indignities. When the Amsterdam authorities removed The Night Watch from its original location in 1715 to the Town hall they discovered the painting was too large for the space it was meant to fit. Like all right-thinking bureaucrats they decided, if the space was too small for the large painting then, rather than enlarge the space, better to reduce the painting and they proceeded to cut the Night Watch down to size by slicing away a large chunk of the left side and a strip of canvas along the bottom. This accounts for the somewhat skimpy, not quite balanced, appearance The Night Watch has today. The cleaning of a painting with important symbolic or religious values was in past centuries often tackled in a quite rough and ready manner, often by custodians quite unskilled in caring for paintings. From the 1550s through to the early part of the twentieth century the kind of cleaning advice freely available from the great and the good of the world of art including Rembrandt’s friend Karel van Mander and La Fontaine was varied and novel and always damaging to paintings. Among the various remedies proposed one time or another were caustic soda, nitric acid, mixtures of black soap and warm urine or, if the old varnish proved impervious to these methods you were advised to use a stiff brush and apply pumice powder. One can imagine the effects these had on the delicate and fugitive colours used by many painters, fine and fragile gold-leaf backgrounds on panel paintings and the delicate and subtle transparent coloured tints most artists applied as a final layer to add depth and volume to the finished work of art. What probably saved most paintings was neglect and general indifference allowing them to reach our own day relatively unscathed. This rough and ready approach to cleaning old and darkened paintings was prevalent up until the cessation of World War ll. The important Rome, Central Institute of Restoration (Istituto Centrale del Restauro) was founded in 1939 in time to prepare it for the destruction of Italian art and monuments that occurred in the coming conflict. Many important Masterpieces of European art, were destroyed in the massive bombing of Berlin in 1945 including the collaborative painting The Vision of Saint Hubert by Peter Paul Rubens and Jan Brueghel de Velours and the Czartoryski Portrait by Raphael. 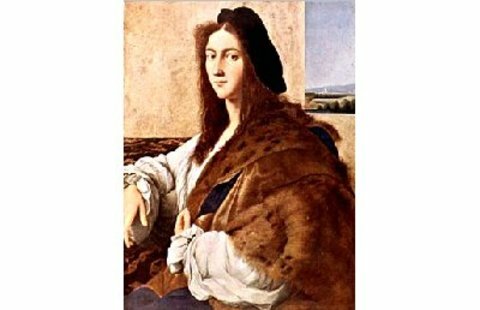 The Czartoryski Portrait by Raphael. 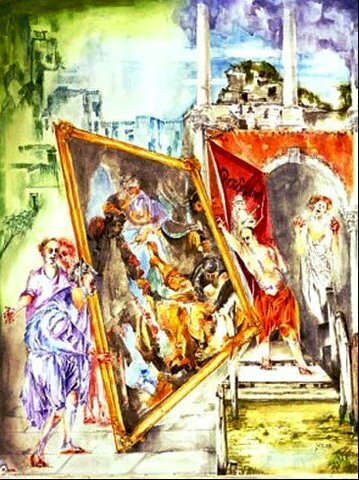 Towards the end of the war the painting was in the possession of the governor-general of occupied Poland, Hans Frank, Hitler’s former lawyer. By the time American forces arrested him the Raphael had disappeared. The need to save and preserve Europe’s reduced artistic heritage, described in the recently published book, The Monuments Men by Robert Edsel created a more analytical and scientific approach to the conservation of the monuments and works of art that did survive. Giovanni Urbani one of the early directors of the Central Institute of Restoration often talked about a legend that circled in Rome during the early part of the last century. It was, apparently, the practice in conservation circles that when an aged ‘gallery’ varnish was particularly resistant to normal cleaning methods one should pour methylated spirit onto the surface of the painting and set it alight. There was a belief that the shock to the picture’s fragmented varnish would be sufficient to make it easier to remove. Creating in the process what one would call a Tableau Flambé. Given that today the greater number of paintings are congregated in art museums it is not surprising that such institutions create, on occasion, their own special paintings disasters. Particularly unique was one that occurred in the Louvre on 3rd. June 1992. The Marriage Feast at Cana by Veronese is a massive 6.66×9.90 meter Venetian Mannerist canvas, part of Napoléon's war booty from his 1797 Italian campaign. It was being rehung on the walls of the Louvre museum after a $1 million restoration and conservation makeover that included cleaning the painting and relining a new canvas on to the back. Unfortunately, while trying to re-hang Veronese's masterpiece, museum technicians lost control of the enormous and heavy painting. For reasons beyond their control they were unable to prevent the massive stretched canvas from slipping from their hands. The painting came to rest on the scaffolding being used to support it while being manoeuvred. The canvas under a drum skin-like tension landed on the points of five of the framework's metal bars which punched through the canvas and out the other side. Embarrassed Louvre authorities initially minimised the disaster especially as, two days previously, the restored Marriage Feast was damages by water from a flash flood. Paolo Veronese, The Wedding Feast at Cana. Venice’s greatest artworks was cut in half by Napoléon’s army in 1797, for transport to the Louvre, Paris. It was recently replaced in the Church of San Giorgio Maggiore by a large digital print. The incident inspired the author some years later, with his fine-arts-conservation background, to create the painting “Well, it looks like, once more back to the restoration lab ". The Toilet of Bathsheba by Giovanni Antonio Pellegrini, Venice1675-1741.Irish National Gallery. Painted in the Rococo style. Before restoration, during and after.